My hubby went to a conference in Manchester last week. He came back with little gifts for me and the kids. Wonderful! He brought me coffee and chocolate. He knows me so well. Not just any coffee, he brought a few packs of Starbucks new VIA coffee. "This is not instant coffee as you know it. 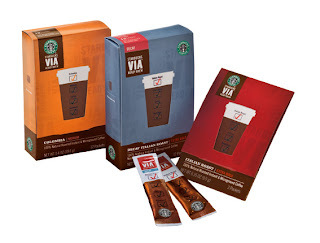 This is rich, flavorful Starbucks® coffee in an instant." Since moving to the U.K., I have rarely had a good cup of coffee. I LOVE this coffee. My hubby gave me this gift in the morning as I was about to make a cup of coffee. I promptly made myself a cup of VIA instead. Amazing! Drifting from my cup was the smell of Starbucks coffee. I cautiously took a sip and almost melted. This was like drinking a coffee straight from the local Starbucks, but instant ... just add water. Instead of being freeze-dried, not-at-all-coffee-like instant coffee, for VIA they "microgrind the coffee in a way that preserves all of their essential oils and flavor." This finely ground coffee dissolves in the hot water and tastes like a freshly brewed cup of wonderful coffee. I have tried the regular Columbia and the decaf Italian Roast. Both are terrific! The only downside is the price. On my new, much tighter budget, I can't bring myself to spend 50p (about 75 cents) every day on a cup of this. But it is still much less than running to Starbucks every mornings, and reserving it for those I-really-need-a-good-cup-of-coffee mornings just makes it taste that much better. Check out more things people love at The Diaper Diaries. A Daughter after her Mom's own heart. Wonderful I called mom and read this to her. We will both had a great laugh. " I melted"
Unfortuantely I am more of a hot chocolate girl than a coffee drinker. I love the smell, though. I really like VIA too. I've heard people complain about the taste and about it being "not the same" - but that's the point! And it IS cheaper than visiting Starbucks every day. Great MOMMY treat when you need one!!! Good for you! I've always wondered how those things were. I'm glad you are able to enjoy a good cup of JOE in the land of tea. Miss hearing from you once in a while.